This book provides the groundwork for a general theory of modern capitalism by reinterpreting Max Weber’s work on the origins and institutional underpinnings of modern capitalism, and Joseph Schumpeter’s thought on the mechanisms and functioning of the capitalist economy. Focusing on the lesser-known works of both figures, particularly in the case of Weber, whose writings on economics and economic history are frequently overlooked, the author contends that a combination of Schumpeter’s and Weber’s theoretical schemas, incorporating their many valuable insights, provides the basis of a unified, overall theory of modern capitalism that is comprehensive, coherent and persuasive. 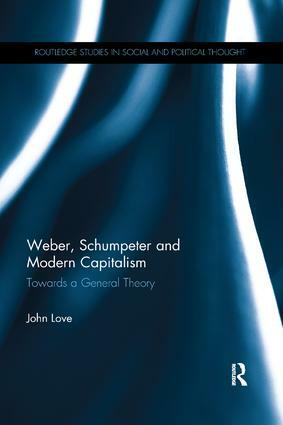 With attention to the important theoretical connections between Weber and Schumpeter and the respective contributions of both with regard to the nature and workings of capitalism, the author explores the compatibility of the two approaches, arguing that the full significance of the contributions of the two writers has not been adequately appreciated. A systematic and sympathetic comparison and synthesis of the contributions of two of the central figures in social and economic theory, which highlights the enduring relevance of their work in times of political and economic crisis, Weber, Schumpeter and Modern Capitalism will appeal to scholars across the social sciences with interests in social and economic theory, classical sociology and economic history. John Love was formerly the Ashworth Lecturer in Social Theory at the University of Melbourne, Australia and he is the author of Antiquity and Capitalism: Max Weber and the Sociological Foundations of Roman Civilization (Routledge, 2005). He is currently a practising barrister in Melbourne.